adir1 | Windows Vista – I found the WOW! Windows Vista – I found the WOW! Granted, this post is a bit early, I’ve only been using Vista on the my new PC for about a week and a half, but I just had to blog about it! So far it’s been fantastic! I want to start off with a short list of pointers that may help you with your Vista experience, and end with solid scientific explanation as to why Vista is the Wow! that was promised! Search box is your friend! 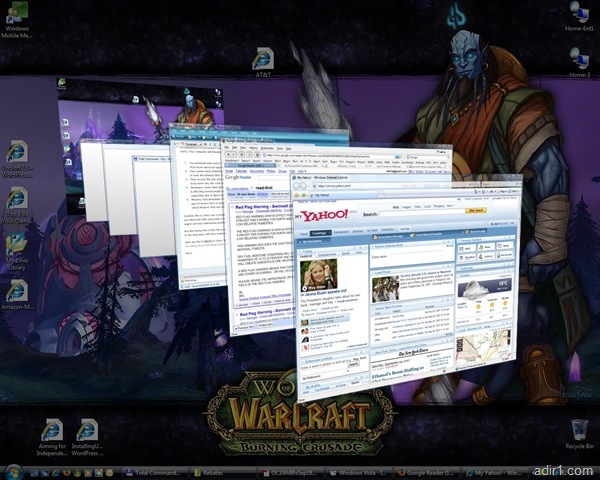 The biggest feature in Vista is the little Search box and you can find it Everywhere! Start with the Start Menu, which makes it easy to launch program or document by just typing a keyword or two. Proceed to use it in Control Panel, which is redesigned, but it doesn’t matter since it has a search box which makes it easy to find what you need if you know it’s name. If you don’t know what it’s called, the newly improved categories are great! Create Restore points often! See tip above to easily find this feature in Control Panel. I didn’t need to use any of my Restore Points yet, but it’s nice to know they are there! As annoying as User Access Control is, it’s worth it! This is the famous "You clicked on this Button, are you sure you clicked on it?" style prompt. When setting up the computer in the beginning, it will drive you crazy. But, keep at it, because the amount of prompts declines drastically once you "settle in", and the added security is very important! Do NOT Upgrade to Vista on an old PC, that is not the intention. Vista by no means "lean", it’s a fully featured OS with high hardware requirements. So, your best bet to get Vista is only with a new PC. If you are worried about Software Compatibility issues, and considering Windows XP downgrade on a new PC, DON’T DO IT! Use Microsoft’s free Virtual PC within Vista should supply full compatibility with the trickiest of software. Plus, most companies should come out with new Vista version of their software soon, if they haven’t already. For me, the Wow! in Vista is the amazing performance, stability and the security, and of course the new fancy 3D Aero effects (tip: Press Windows-Tab key and scroll mouse wheel). Here’s the real Wow! and it is something I haven’t seen covered in almost any press coverage for Vista. It’s the quality feedback agent, which is now built into Operating System Kernel and most Vista applications and components. Let me explain, this little known secret agent gets activated whenever you encounter any kind of crash/failure and in some similar scenarios. It actually Phones Home to MS HQ and records this trouble, along with supporting "Dump" info, in the central database. And before you start screaming PRIVACY, it can be disabled and it only activates after asking you if you wish to "Help Improve Windows Experience" or some such. You download some patch or new driver, or simply add new hardware that Vista knows about but apparently wasn’t fully tested (or too new). Your system starts misbehaving, things don’t work. You get crashes somewhere, or even the infamous Blue Screen of Death comes to visit you. Granted, this is a best case scenario. There are lots of trouble reports daily, and I am sure Microsoft folks using some sort of statistical data mining approach to find most urgent and most mainstream problems, before tackling more obscure ones. But the bottom line is that this process Will Surely lead to better and more stable OS in the long term, with more features and compatibility. …but these things have been implemented in OS X for over 7 or so years and work better. Screw you Paul Alves, Vista rules. Then why is it bluescreening all the time? Yea, Paul, and OS X also has Back in Time feature, right? The one that Vista taunts as File Versioning, in Business and Ultimate editions. Oh wait, OS X still doesn’t have that!!! Maybe it will come from the future and move back in time to be active 7 years ago, to help me recover all those photos I accidentally wrote over with newer “corrupt” version. BTW, All those visiting my blog for the first time. The PC I Built is CUSTOM Box, so those are the Hardest to get working and ensure hardware compatibility without blue screens or problems. I hand-chose each component, and did not splurge for top of the line either (see my earlier post). I wonder why such a WOW system will have a WOW defect reporting system ? I’m using Linux mandrake and it has a 3D features too…and I think its much better than vista….